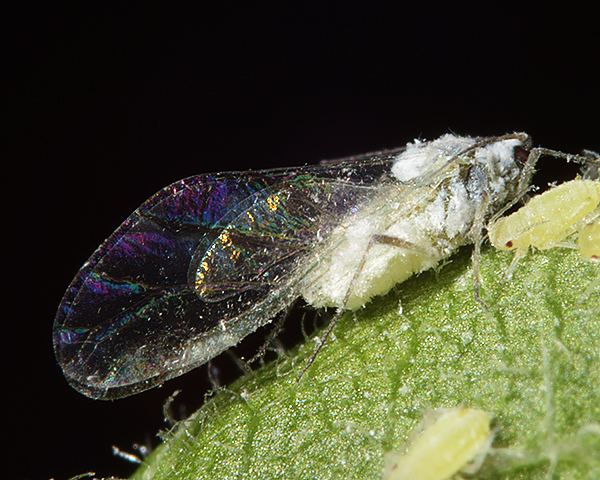 Hyalopterus are small to medium sized elongate aphids, the adult viviparae of which may be winged or wingless. They are usually pale green mottled with darker green and most are covered with a white waxy meal. The antennae are shorter than the body, and the siphunculi are very short, thicker and darker towards their tips. The cauda is markedly longer than the siphunculi. Hyalopterus are a small genus, with only 3 species. They may retain the sexual stage in the life cycle and alternate between plum (Prunus species) in winter/spring and common reed (Phragmites) in summer, or may live year round on either host. 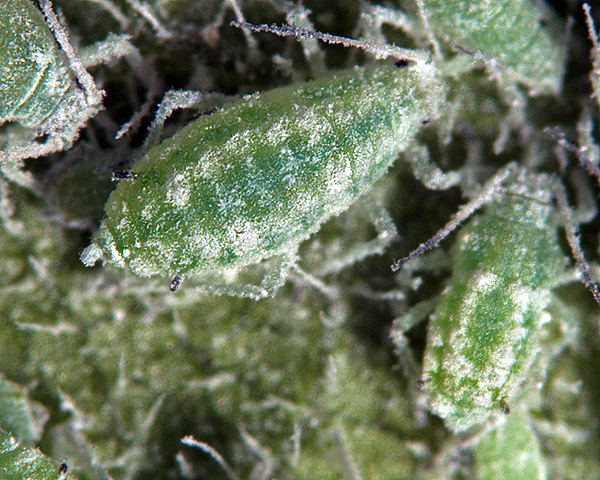 Hyalopterus aphids are not attended by ants. One species is an important pest of plum trees, which are affected by fungi growing on the honeydew-coated leaves. The Hyalopterus pruni aptera is a small to medium sized aphid, 1.5 - 2.6 mm long, with an elongate shape. It is usually pale green with a fine darker green mottling, covered with wax meal (see first picture below). The antennae are quite short, between 0.5 - 0.75 times the body length. The siphunculi are very short, and are thicker and darker towards the apex; they are also flangeless and rounded at apex. The cauda is 1.5 - 3.0 times longer than the siphunculi. The Hyalopterus pruni winged form (see second picture below) is green with white wax patches on the dorsum of each abdominal segment. The mealy plum aphid host alternates between its winter host - Prunus species, mainly plum but also especially on apricot, and perhaps on peach or almond, and its summer host - mainly reeds (Phragmites), but also giant cane (Arundo donax) and some other wetland grasses. Some aphids remain on plum all the year round. Hyalopterus pruni is cosmopolitan, but may have geographical races or subspecies.